Found a huge dripping leak when cars running that at first looked like oil pan. Its a constant flow. I sprayed under the car and looks like its actually flowing from behind the crank... assuming that the front main is toasted. just want to verify from anyone that may have done this. If there's a major leak in the front of your VQ, it's likely not that easy. How many miles are on your Z? . The cause of this leak could be anything from a cracked oil pan, fitting or seal. Do you have the tools and skills to pull the front end and possibly pull the VQ? Do you have the time (and garage) to spare if complications arise? definitely not the oil pan... i cleaned everything and started the car and watched the river run from behind the crank pulley. Kind of ignore this - I misread something. Pretty easy, you might need to get yourself an engine support brace because you'll need to remove the engine sub-frame and hold the engine in place, and move the steering rack out of the way a bit (I didn't disconnect it, just moved it). You need to do that because the upper oil pan won't come out otherwise. If you do that with the steering rack, make sure you put some paint marks on the upper and lower part of the yoke to get your steering lined up when you put it back together. My engine support brace had a couple of chains with it, and I bought a couple of 1 ton support straps to wrap around the engine mounts, it did the job fine just ensure you do it neat as possible as the weight will remove the slack quickly if you aren't careful. I found WD40 softens the old RTV, and a few plastic scrapers make reasonably light work of removing it all. 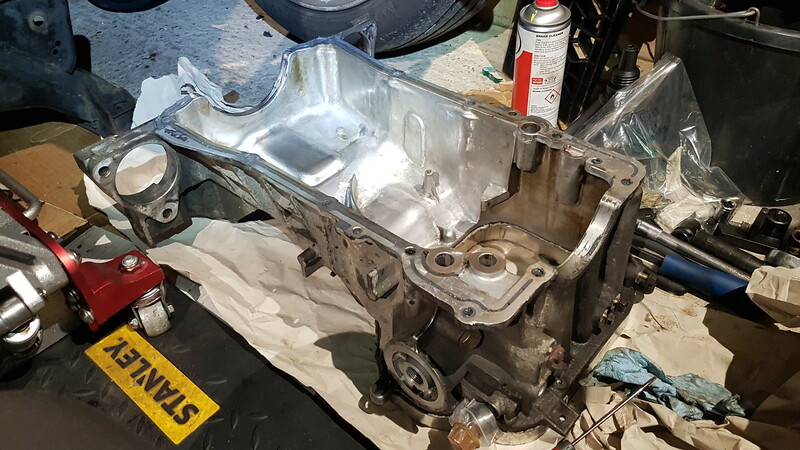 There are a couple of pry spots on the upper oil pan (near bolts 1 & 2), just over half way along and pointing towards the front of the car IIRC. There are a couple of dowel pins near there which is why it's the prying point. Last edited by RobPhoboS; 02-11-2019 at 05:42 AM. Apologies I mis-read something initially. 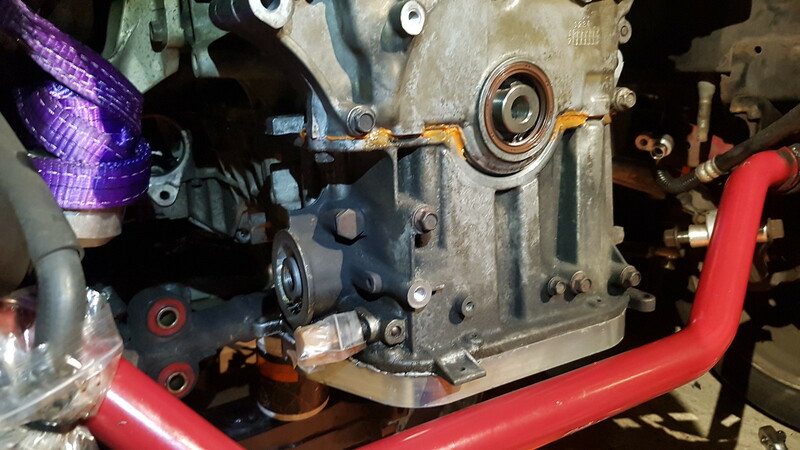 If it's the crank seal, you'll need to pull the front timing case off as well unfortunately, if it's the upper oil pan seal then you won't need to worry about the timing case. correct me if I'm not seeing something correctly but it looks like that seal can pop right out the front and you press back in. That's also how the diagram breakout makes it look as well. If I'm wrong could you explain why I would need to pull the timing cover? Last edited by Enriquez2000; 02-11-2019 at 05:33 AM. Depending on your intentions with the car, it's well worth doing a few preventative bits with the mileage/age but if it's just a car to run around in, no worries. It might be worth posting something up when you tackle it, always useful for others. Getting this bit of info makes me think you're wasting your time by just trying to put together a small fix. With 120K and FI, it's time to build the shortblock at a minimum. Face it, this VQ was never designed for FI and has worn rapidly. All that labor goes to waste if you don't do the repair the right way. Come DK - don't get dramatic! yes, the VQ wasn't 'built' per say for FI but 8 or 9 psi of boost never hurt anyone...especially at elevation! Anyone with built engines have rear main seal woes? Quick Reply: Front main seal replacement?